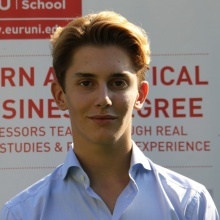 Felix Hill is a student currently studying at EU business school, situated in the Geneva campus, as alumni he decided to take full advantage of what EU had to offer and immediately decided to apply for a position within the student board as head of sports. Once achieving the position, he successfully organized an inter university football tournament whilst leading his team to second place. Over his many years of education around Europe, Felix has achieved in which ever environment or task he was set too. From formal education and achieving academically too being offered internships by successful hedge funds such as Church Hill Cap. He has also worked in different areas of the business world such as the area of retail, throughout his summer he was employed in a vine cave and due to his ability to speak multiple languages he created a boost in sales, he understood clientele’s willingness to spend more when served by someone who speaks their own language and may relate to them. Due to this Felix is believed to truly understand what it means to be a leader in the society and business world that we live in today. At the tender age of seventeen he has already experienced many aspects of the world of business from real-estate, stock trading, to retail each on different scales needing different sets of skills to succeed. From quantitative analysis and research skills, all the way down too advertisement, oral and communication skills. One of the best examples of Felix maintaining the role of leadership was when he was part of the Royal Marine cadets, as such he was sent on gruelling missions and at times needed to lead his group of soldiers. In his opinion the best leaders are the ones who are able to bypass people’s culture, traditions and upbringings see what lies underneath all of this and pick out their true set of skills to run any process as efficiently as possible by putting each member in their respective positions and running them well even if it would be under adverse circumstances.